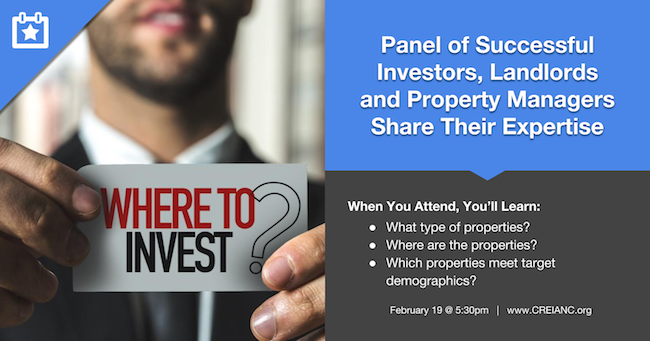 As a precursor to Real Estate 101, Carolina Real Estate Investors Association’s February 19 main meeting hosts a panel of seasoned, successful investors, landlords and property managers. • What type of properties: single-family, multi-family, apartments, mobile homes? • Where are the properties: local, regional, national, international? • Which properties meet target demographics: neighborhoods, near a college or bar, attractive to young families or professionals, is walkability or country living important? • What is the target rental price: low, mid or high-income bracket, Section 8 subsidized or private payments? • Will the portfolio be self-managed or will a property management company be used? Hear from industry experts who have made those decisions and are willing to share their knowledge, expertise and strategies of how they successfully acquired and intentionally navigated the real estate landscape to build their portfolios. Meet our esteemed panel: John Maltry, Nancy Duggan, Bob Bryenton, Rodrigo Afanador, Phyllis Fitzgerald and Glenn Person.